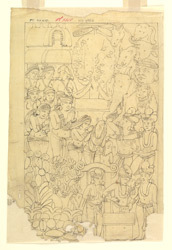 Ink sketch on tracing paper by Frederick Charles Maisey of the carved panel on the inner face of the west pillar of the West Gate of the Stupa of Sanchi. Inscribed: 'XXXVI' (in black ink), 'XXIV' (in red ink). Reproduced in Maisey, F.C. 'Sanchi and its Remains' (London, 1892, plate XXIV) and in Fergusson, J. 'Tree and Serpent Worship' (London,1873, plate XXVII, fig.2). The four magnificent gateways or toranas of the stupa (a Buddhist monument consisting of a domed-shaped mound often containing sacred relics) of Sanchi were added to that monument during the first century BC. They consist of square posts, crowned with a set of four lions, elephants or pot-bellied dwarfs, supporting three curved architraves with scrolled ends. They are completely covered with relief sculptures depicting Jatakas (stories of the Buddha's earlier incarnations), scenes from the life of the historical Buddha, and Buddhist symbols. This drawing represents the panel carved on the west gateway. The scene represents worshippers performing the ceremony of circumambulation around a bodhi tree with an altar. The parasoled tree is the aniconic representation of Buddha. gateways were added at the cardinal points.